HENRY Augustine Chuah has an unusual hobby. 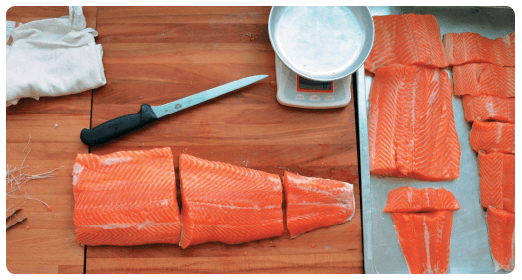 On Saturday afternoons, the banker puts away his loafers and fires up a hand-built smoker, which imparts dense, smoky flavour to racks and racks of cured sushi-grade salmon for three to four hours. The result is completely cooked, aromatic fillets with a delicate and creamy texture as well as a near-caramelised exterior. Chuah first tasted and fell in love with hot smoked fish when he was a student in New Zealand. Since then, he has made it his mission to replicate that experience for others. It began as a small project with family and friends — they would drop by to help smoke and then sample the fish. “The sheer amount of time and attention put into doing it the best we can is almost like a discipline. It’s very precious,” says Chuah. Smoking was used in the past to preserve food, but it is now better known for its ability to add taste and flavour. Smoked fish, however, is not cheap. Fish varieties that are commonly hot smoked include salmon, trout, mackerel and herring. Chuah plans to eventually offer smoked local fish that will be just as tasty but more affordably priced. 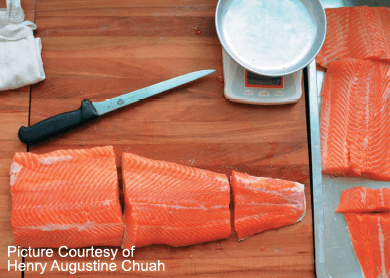 Currently, Augustine Smokery — his home-based business — offers hot smoked salmon as well as provides smoking services to clients who want to add extra flavour to meat, fish or cheese. Apart from individual customers, he supplies smoked salmon to cafés. Chuah places great emphasis on freshness and quality ingredients. The salmon used is air flown from Norway, Australia and the Netherlands, and he pays close attention to the farms his stock comes from. The salt for curing is the moist sel gris from France. The current smoker Chuah is using — christened Mark III after Iron Man’s suit — was built by him and his childhood friends, Kington Lee, Lee Chee Hoe and Yann Shun. Two of them are engineers and they helped design and put together the latest equipment after Chuah outgrew his two smaller-scale smokers. He shares that Mark I had comprised two Daiso drip trays and, together with an initial bag of wood chips, took a mere RM40 to build. The Mark III is a whole ’nother beast. About the size of a small refrigerator, it is built from combustion-resistant merbau wood sourced from a local carpenter and can smoke up to 20 fillets in two hours. Chuah says about RM2,000 has been put into the business so far. An initial group of investors — his friends — contributed seed money, but the amount has since grown. Nevertheless, like many startups, he considers time the biggest cost, having worked on this project since 2012. When people think “smoked salmon”, they’re usually thinking of the cold smoked variety, with its smooth, raw, sashimi-like texture. Most customers he has talked to have not even heard of hot smoked salmon. They are sold at very few restaurants, and there’s only one commercial factory and three small smokeries here producing them. In other words, Chuah is offering a brand new product to most Malaysian consumers. This comes with its own set of challenges. “When I say ‘hot smoked salmon’, people tend to filter out the word ‘hot’, so maybe I’ll have to change the name to smoke-roasted salmon or even kippered salmon, like what some Americans call it. “I have to relaunch it and make it separate. People’s perception has to be the biggest challenge I have faced so far,” he says. Chuah has started experimenting with smoking local fish and plans to offer it when he has refined the recipe. He is looking to obtain tilapia from an eco-friendly, sustainable farm in Tasik Temenggor, which would cost more than the average tilapia but still be cheaper than salmon. In pursuit of a more original product, he is also looking to import fresh wood from farms in New Zealand. He explains that the types of wood in Malaysia that he can use are fairly limited, whereas New Zealand’s manuka and pohutukawa wood chips offer sweeter, unique flavours. As for his day job, Chuah is not ready to call it a day yet, but he is open to running his business full time when the right opportunity comes along. “If this project kicks off, if it progresses even better than the other job, then why not? It’s a good option,” he says. This article first appeared in #edGY, The Edge Malaysia Weekly, on April 27 - May 3, 2015.